A missing tooth or series of missing teeth can contribute to the development of decay and gum disease. Replacing missing teeth helps maintain good dental health and success with eating and speaking. Fortunately, there are several options for correcting tooth loss. These options include dental bridges, removable partial and full dentures and dental implants. One of the worst side effects of missing teeth is an increased risk of gum disease, which can be partially prevented with the use of a dental bridge. A bridge replaces missing teeth, attached firmly to surrounding teeth to stay in place. Dental bridges can be made using porcelain, gold, or a combination of these materials. Fitting a dental bridge usually takes two appointments to complete. Dr. Sims and Dr. Kapur will first prepare the teeth, then impressions of your teeth are taken and sent to the lab to ensure precise construction of the bridge. Between appointments, a temporary bridge will be provided to protect the teeth. Crowns, which are cemented onto the natural teeth, provide support for the bridge. Fixed bridges are cemented to the natural teeth next to the space left by the missing tooth. A false tooth replaces the lost tooth. 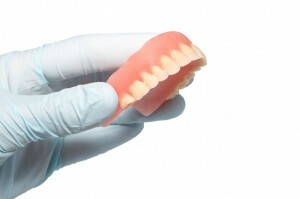 Partial Dentures – A removable partial denture is constructed of replacement teeth attached to a gum-colored base that attaches to your natural teeth with clasps to keep them in place. Your natural teeth are used as stable supports for removable partial dentures instead of dental implants. The alignment of your jaw will slowly change as the bone and gum ridges shrink due to teeth extraction. All types of dentures will experience wear over time, and will need to be replaced or realigned in order to maintain proper jaw alignment. 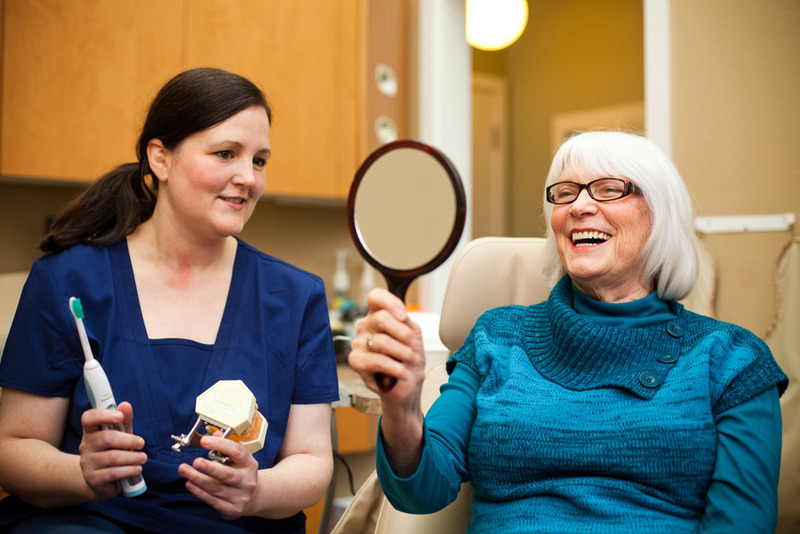 Regular dental exams are still important for the denture wearer so that gum tissue can be checked for any changes or potential gum disease. Dental implants provide a stable and convenient way to replace missing teeth, offering support for crowns, bridges, and dentures. 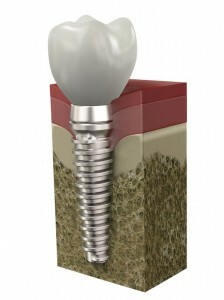 Dental implants are fixtures of titanium that are surgically placed into your jaw bone, taking the place of a tooth’s roots. The implant acts as an anchor for a crown or denture to fit over. When a crown is placed on an implant, most people can’t even tell it is an implant because it looks like a natural part of your smile. A dental implant requires no alterations to the adjacent teeth. Diligent daily oral hygiene is required for implants to stay clean and healthy. It’s also important to regularly visit Dr. Sims and Dr. Kapur for routine follow-up appointments and cleanings to keep your new smile healthy and bright!